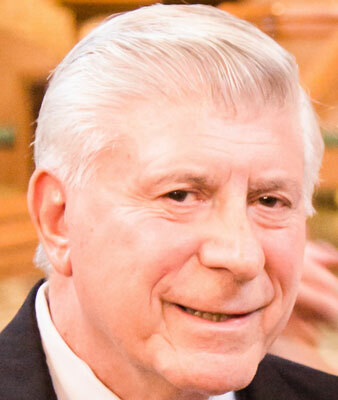 GEORGE R. CARUSO CANFIELD – George R. Caruso, 76, formerly of Austintown, passed away peacefully on Wednesday, Dec. 28, 2016, surrounded by his loving family. George was born to the late Isabella (Brancaccio) and Gennaro Caruso in Oriolo, Calabria, Italy, on Aug. 16, 1940. He came to the Youngstown area at age 11 and was a lifelong area resident. George served his country in the U.S. Army in Korea and Japan. He was employed by the Youngstown Sheet & Tube Co. (Brier Hill Works) for 20 years. There, he completed an apprenticeship program and became an electrician. He later worked at the fabricating plant of General Motors in Lordstown for 25 years, retiring in 2004. Though he will be remembered for his strong work ethic, George cherished his time off. He thoroughly enjoyed his annual summer family vacations to beaches in Virginia, South Carolina and Florida. George loved watching all sports, especially football. The Ohio State Buckeyes and the Cleveland Browns were his favorite teams. He spent a great deal of time on the golf course in various leagues, including Brier Hill, St. Joseph’s Men’s Club and General Motors. George leaves behind his loving wife of 50 years, Bernice A. (Malenic) Caruso, whom he married July 23, 1966. He also leaves to cherish his memory, three daughters, Christina (William) Simonton of Columbus, Ind., Georgiann (Scott) Caruso-Hornsby of Atlanta, and Michelle Caruso of Cincinnati; two grandsons, William and Andrew Simonton; and sister Lena Viscuso of Italy. Besides his parents, brothers Frank and Joseph preceded George in death. Family will receive friends for visitation from 2 to 4 p.m. on Sunday, Jan. 1, 2017, at the Vaschak-Kirila Funeral Home, 3100 Canfield Road in Youngstown. An additional calling hour is from 10 to 11 a.m. on Monday, Jan. 2, 2017, at St. Michael Parish, 300 North Broad St. in Canfield, followed by a Mass of Christian Burial at 11 a.m. George will be laid to rest at Green Haven Memorial Gardens with military honors. Visit www.vaschak-kirilafh.com to view this obituary or to send condolences to the family.